Steam cauliflower for about 4 minutes or until al dente. Pulse steamed cauliflower in food processor until riced but not mashed or pureed. Mix vinegar into the rice. Set aside in refrigerator until chilled. Lay sheet of nori on a piece of saran wrap covering a bamboo sushi roller, or just simply on a cutting board. Spread an even and thin layer of cauliflower rice over the entire sheet. Sprinkle rice with sesame seeds. Lay tuna strips, cucumber, mango, avocado and cream cheese in an even line close to the bottom of the sheet of nori and rice. 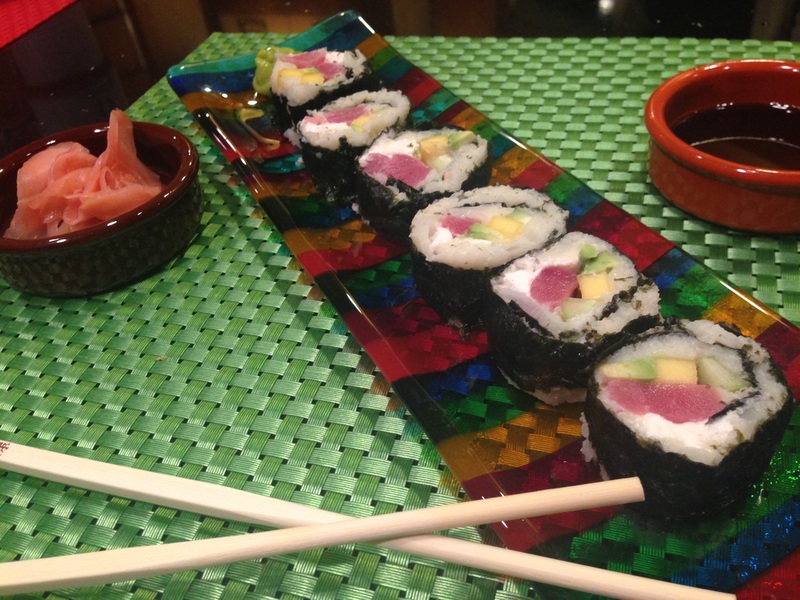 Using the bamboo roller or gently using your hands, fold the bottom of the nori around the tuna and other fillings. Keep rolling the sushi up the nori sheet, tightly until it is fully wrapped. Seal the end of the roll by very slightly wetting the edge of the nori sheet and pressing it to the roll. Using a very sharp and slightly wet knife, slice the roll into 1 inch pieces. Serve with liquid aminos or soy sauce, pickled ginger and wasabi.